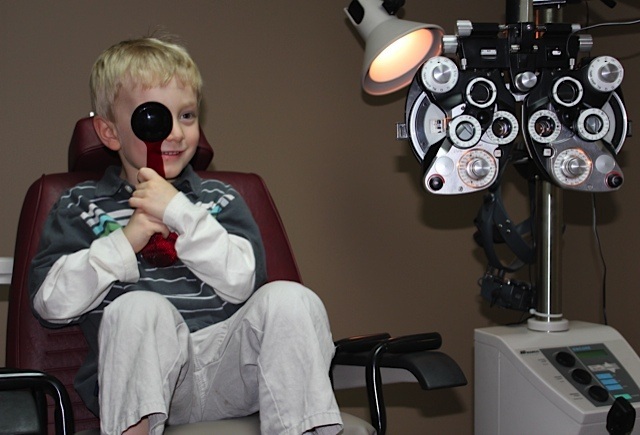 Columbia City Optometry strives to make your child's eye exam a positive experience. We realize seeing the doctor can be scary for your child so we make sure to maintain a relaxed, family environment. Not all optometry practices include a screening for eye teaming issues that relate to learning problems. At CC Optometry we screen all children to make sure they are developing these critical visual skills. Cooing, sitting up and crawling are all visible signs that your child is growing. Your baby's eyes go through important stages, too. Unlike physical development, visual development is not marked by milestones that parents can monitor. We feel a vision assessment is an important step to make sure your baby is learning to see properly. Dr. McClain is the only optometrist in Whitley County who provides a free vision assessment for babies 6-12 months through a nationwide initiative called INFANTSEE. We recommend your child have his/her first eye exam at age 3. Vision is developed and starting very early on, your child's vision can deteriorate due to causes that you may not detect. Most measurements we take to ensure proper vision development do not require verbal response from your child. We do our best to make sure your child has a positive experience. We recommend children have a yearly eye exam while they are in school. Your child's eyes are constantly in use in the classroom and at play, and it is not unusual for a child's vision to change every 6 months while they are school-age. 20/20 vision is only a measure of how well your child sees at 20 feet. It does not mean that while they are reading up close that their eyes focus well or work together. Near vision and eye coordination and movement are the most important vision skills needed for learning. After a thorough evaluation, we may recommend eye glasses, contact lenses or vision therapy for your child. Sometimes a combination of the above may also be recommended. Please see our Vision Therapy section under Services for more information regarding Vision Therapy. If you are interested in contact lenses for your child, please don't hesitate to let us know. Contact lenses are a great option for most kids especially for sport or recreational activities. We may even recommend them to your child because they will see better with contacts due to their prescription. There is not a set age to start a child in contacts. It is an individual decision based on the patients prescription, maturity level and parent guidance. You can discover more information on contact lenses on the contact lens page.